The main feature on the northeast side of Rainbow Mountain's east summit is the striking pillar of Crimson Chrysalis. Unobtrusively to its left is a spur ridge that goes all the way to the top. I had attempted to climb this spur a couple of years prior on a cold November day. After seven or eight pitches, it became clear that we weren't going to make the top with any daylight. 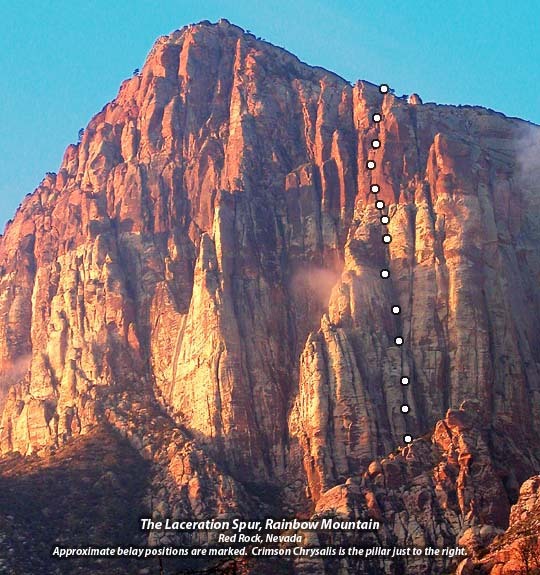 We climbed and traversed three or four unpleasant pitches to the top of Crimson and rappelled that route in the dark. Even with our retreat, it was a non-trivial day. In general, I am much better at naming routes than at actually climbing them, but in this case I still had no idea what to call this thing. No particular feature stood out and my creativity seemed to be on vacation. At the time, it didn't seem important, since the route was far from complete. For some reason, I had been unable to interest anyone in having another go at the line. But Jeff was displaying the kind of gung ho enthusiasm that can get a chap into trouble if he's not careful. So at 4:00 a.m. on a late summer morning, we found ourselves walking through the darkness with fifteen pounds of water and enough gear to partly counterbalance our apprehension. After wandering through the network of trails in the desert, we staggered up the steep Crimson Chrysalis approach ramp. 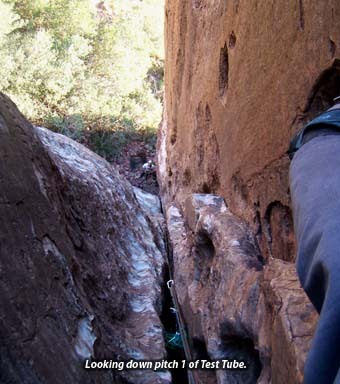 Finally we dumped our gear at the base of Test Tube, an old Urioste route that joins my original line three pitches up. Above us towered a clean polished corner that appeared to turn into a slick chimney a hundred or so feet up. 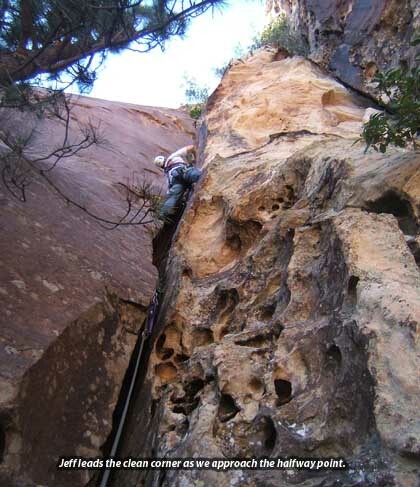 After contemplating the 5.9 crack, Jeff said, "Face climbing is more my style; why don't you take the first lead?" On my previous attempt, we had climbed an unrecorded crack system some distance downhill. That cold and damp day made the Test Tube dihedral look especially hostile. Today's plan was to climb Test Tube, then continue on the original line to the top of the ridge. The difficulties began soon enough with a battle in the polished corner. 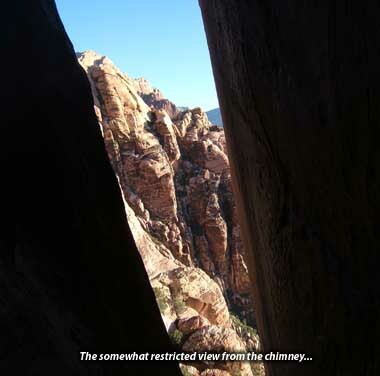 The jams were strenuous enough, but when it became a chimney it was truly baffling. I would put my back against the slick, polished, utterly flawless wall of the chimney, and somehow there would be something uncomfortable gouging a bio-crater into my spine. Protection being what it was, I had no good opportunity to dwell on this contradiction. "Pitch 1: Climb the chimney until you want to kill yourself. Pitch 2: Repeat for the next 12 hours. (5.9)"
There is a large ledge just a little under halfway up. In my daydreams, I expected to glide up to this ledge by about 9:00 in the morning, then take my time divining the most aesthetic passage on the upper wall. Reality found us reaching the ledge at about 11:30. I had vaguely entertained thoughts of tackling a flared offwidth on the left side of this ledge, but the added time pressure now saved me from such reckless ambition. From experience, I knew that the corner on the right side of the ledge was clean, elegant and 5.9, so I immediately suggested that Jeff lead it. He tackled the steep dihedral with coolness and efficiency, and soon we were climbing into new territory. By the clever expedient of underestimating the next pitch, I began my lead without the full rack. Of course, I was then out of gear when the difficulties reared up, so I fabricated an uncomfortable belay. Jeff led through and cranked up the steep and gritty face above with such apparent ease that I was faked into underestimating again. "Up rope!" croaked my fearful voice as I seconded the minefield of crispy flakes and fragile horns. "Up rope!" Somehow I had an image of a hold breaking, my body getting lacerated by the rough surface, and rope stretch depositing me at a point where I would have to start all over. Mercifully, the flakes held and no transfusion was necessary. This was the insidious way the route wore us down. There were no free rides. 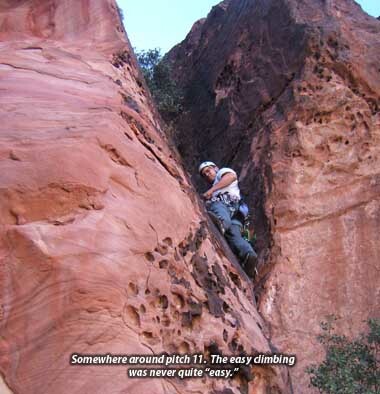 Every pitch had some kind of challenge, whether it was difficult climbing, or fragile rock, or thin protection. Some pitches had all three. If, by some mischance, the technical difficulty should ease, it was virtually guaranteed that the hostile vegetation would tear at your clothes, scratch a nice red grid onto any exposed skin, or attempt to poke out your eye. Sometime in the early afternoon we passed the point of no return. The exact moment was not obvious, but the mental change was. Backing off might have been tempting low on the route, but now it seemed like the efforts to get down would exceed the exertion of continuing. At a deeper level, the sense of commitment altered the way I perceived the entire climb. In the blur, I lost track of how hard each pitch was. I could no longer perceive fine gradations like 5.7 or 5.9; the only question was, "Can I do it or not." If not, find another idea that will work. If I can, then no sense wasting time by hesitating. We kept getting lucky with one thing: the pitches we each got were exactly the ones we were good at. Crack battles showed up on my leads. Jeff somehow got all the grippy face-climbing cruxes. It continued until our fourteenth pitch, when I pulled onto the summit ridge. A brief sigh of relief! Brief because the afternoon sun was low in the western sky and we were still not sure what was in front of us. We quickly coiled the rope, but remained wearing our rock shoes. We were worried that the summit scramble might be harder than we had hoped. We were in an area of tremendous beauty. The pine trees were a deep vivid green. The late afternoon sun was streaming over the top of the Rainbow Wall and the orange rays brought a saturated glow to the tan and reddish rocks. After a few minutes it seemed safe to change into sneakers, which was good news because the summit was still quite a distance above us. We worked our way over the top of the Eagle Wall, and descended through Oak Creek. Darkness caught up to us at the ramp on the approach to the Rainbow Buttress. The fun factor was beginning to fade as we scrambled down the endless boulders and through the scratchy shrubbery. We got to the car at 10:00 in the evening, which made it a short, eighteen hour day for me. Jeff, on the other hand, now had an all night drive back to Arizona, and work in the morning.